I first got that “compliment” when I was in the seventh grade from a boy who thought he was really doing me a favor. 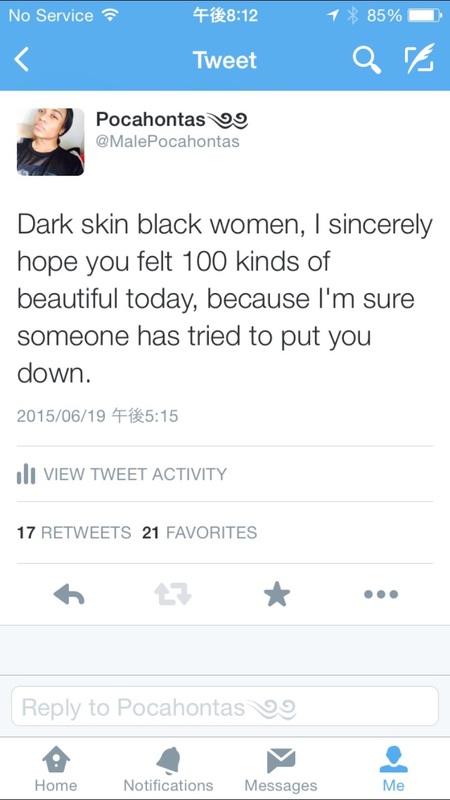 Many black women have experienced the exact same back-handed compliment. I grew up thinking that my blackness was beautiful, but only in relativity and comparison to white beauty. For a long time, I aspired to achieve standards of white beauty because of internalized racism. I strived for long, straight hair, a tiny waist, a tiny bottom, tiny thighs. Everywhere I went, I saw pale faces on magazines and on movie screens. If you Google, “beautiful woman,” the first 100 or so pictures are of white women. You’ll occasionally see a Latina woman, a few Asian women, and one or two light-skinned black women. But dark-skinned black women were rarely seen as beautiful in the mainstream until recently. I had always loved Beyoncé, Halle Berry, and Zoe Saldana; their representation of blackness in the media was, and still is, important. But where were the dark-skinned black women to look up to, to see and say, “Yes, she is beautiful on her own accord”? This idea was basically nonexistent until I reached college. It started as most body positive things start, with a Twitter hashtag (in this case, several). I started seeing #blackgirlmagic, #myblackisbeautiful, and #blackexcellence on the social media site, along with beautiful black women in every shade. 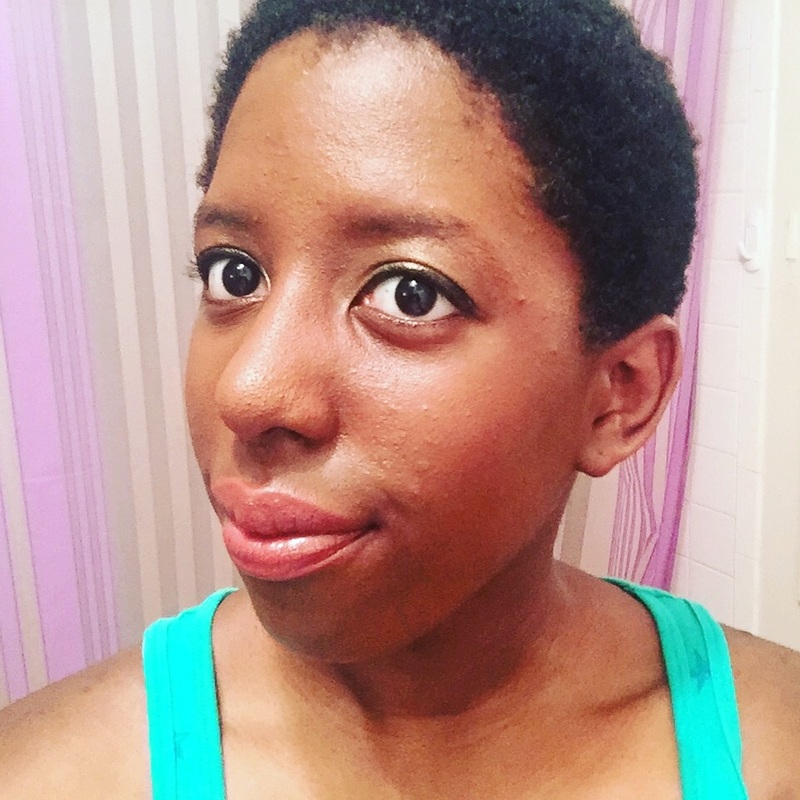 On Tumblr, they would hold several #blackout days a year, where black Tumblr posted selfies to show that black skin and dark melanin were inherently beautiful. I saw Lupita N’yongo, Viola Davis, and supermodel Maria Borges — celebrated, gorgeous, dark-skinned black women who rock their natural hair and beauty with flawlessness. Seeing representation from celebrities and fellow peers is of the utmost importance. But I’m starting to see myself and people with my dark skin tone in makeup ads, on the runway, in commercials, in beauty campaigns and more. My black is beautiful. I started to embrace my dark melanin, my rich dark skin, my glowing dark skin for everything that it was. I am an African Queen, a dark-skinned goddess, a melanin princess. And whenever I start to feel down about my dark skin, I think back to when I was eight years old. My absolutely gorgeous fair-skinned, blonde haired second grade teacher was quietly walking around the classroom as she watched my class during coloring time. She stood behind me for a few moments, admiring the adequate house I was drawing before sitting down next to me, her head cradled in her delicate hands. She placed one of her milky white, pale hands next to mine. I cringed, wondering what she thought, how she perceived me. At the time, I was playing with white Barbie dolls and watching white Disney princess movies. I did not know that my black was beautiful just yet. “Your skin is just gorgeous,” she murmured with a sweet smile on her face. “Absolutely rich and just beautiful. I wish my skin was just like yours.” I remember being so shocked and pleased. This striking woman who I so admired wanted my skin while I was busy being envious of hers. That has always stuck with me, that my dark skin is gorgeous, that being envious of others is fruitless, and being comfortable in my own skin is worth it. I look at my mother, the most beautiful woman I know, and she is dark-skinned. Many of my stunning black female friends are dark-skinned. I am dark-skinned, and my black is beyond beautiful.